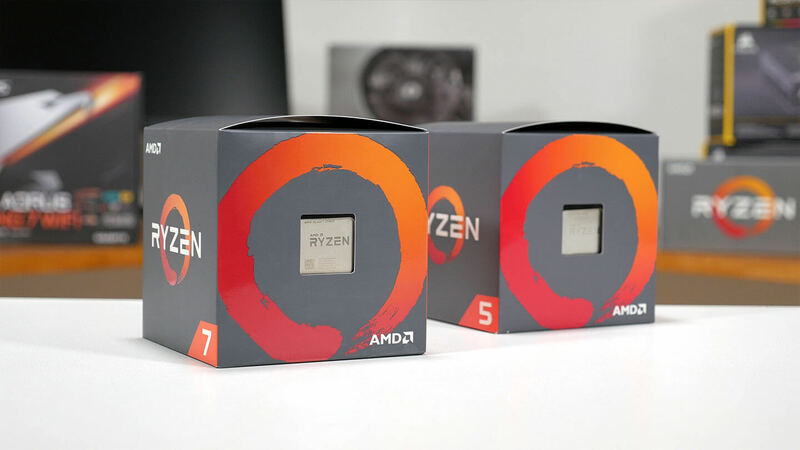 AMD has finally unveiled their 2nd-generation Ryzen line-up today, after weeks of leaks and rumors surrounding the hotly anticipated processors. While we can't talk about performance numbers or anything aside from a surface-level overview just yet, we do have information on the processor specifications and prices to share. The 2nd-gen Ryzen line-up includes four processors: two in the Ryzen 5 series, and two in the Ryzen 7 series. All four CPUs will be available on shelves worldwide on April 19, with pre-orders starting today. As always we recommend waiting until you see our review on April 19 before you buy, but if you really want to pre-order, you should be able to do so now. At the top of the line-up are the eight core, 16 thread Ryzen 7 processors: the Ryzen 7 2700X and Ryzen 7 2700. This time around, AMD has tightened up the pricing between the non-X and X models, while choosing not to produce a successor to the Ryzen 7 1800X. The Ryzen 7 2700X is priced at $329, and comes with a 3.7 GHz base clock and 4.3 GHz boost clock, along with 20MB of cache and a 105W TDP (up from 95W). The Ryzen 7 2700 will cost $299 with a 3.2 GHz base clock and 4.1 GHz boost, along with the same 20MB of cache but a lower 65W TDP. In the Ryzen 5 line we're looking at two processors with six cores and 12 threads: the Ryzen 5 2600X and Ryzen 5 2600. The 2600X costs $229 and provides a 3.6 GHz base clock with a 4.2 GHz boost, with 19MB of cache and a 95W TDP. The cheaper 2600 is just $199 and for that you get a 3.4 GHz base clock with a 3.9 GHz boost, plus 19MB of cache and a 65W TDP. Like with 1st-gen Ryzen, all 2nd-gen Ryzen CPUs are unlocked and fully overclockable on supported motherboards. All also come with box coolers of varying qualities, which is a change on 1st-gen Ryzen where some X models did not include a cooler. The 2700 and 2600X get the existing Wraith Spire, and the 2600 gets a Wraith Stealth. The 2700X comes with an all-new cooler, the Wraith Prism, that is improved in several areas. The fin profile has been adjusted to give better clearance to surrounding RAM sticks, and there's now direct heatpipe contact to the CPU. The cooler is quite hefty and includes a fair bit of copper on the base, plus you get a clear fan with an RGB ring around the outside. Pretty impressive for a box cooler, though we can't tell you how well it works just yet. It's also worth mentioning that 2nd-gen Ryzen parts are built using a 12nm process and use the Zen+ architecture, so it's not a full architecture refresh, but we will be seeing some minor improvements along with gains relating to the shift from 14nm to 12nm. You'll find out more about IPC improvements and overclocking on April 19, though you can already see these processors have higher clocks than their predecessors. As for the X470 platform, which AMD has also unveiled today, we'll be seeing a massive range of new motherboards hit the market that support the new chipset. X470 will coexist alongside X370, B350 and A320 for now; AMD has not announced a 'B450' or 'A420' today. The main advantage to X470 over X370 is improved power infrastructure to better support 2nd-gen Ryzen and provide higher clocks, though of course 2nd-gen Ryzen chips will work in 300-series motherboards, too. X470 boards will also come with StoreMI technology for free, which is basically a RAID-like utility that combines all the storage drives in your system. However the unique feature here is StoreMI will move around the files on your system to ensure the most frequently-accessed files are on the fastest drives, a bit like a caching system, for maximum performance and the fastest game load times. That's all we can talk about right now, you'll have to check back for our full review on April 19 for everything else you want to know about 2nd-gen Ryzen.